Hooray for pirates! 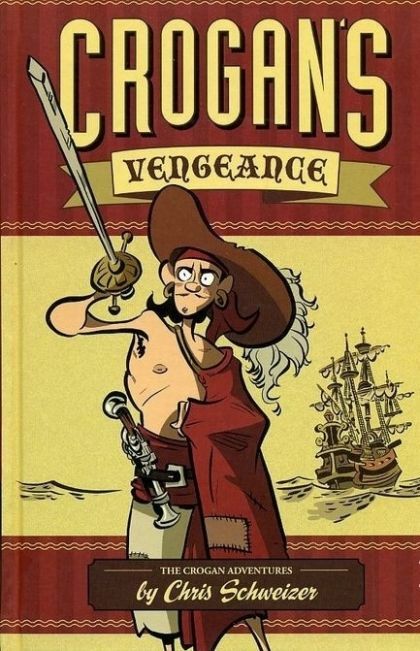 Today I’m reviewing “Crogan’s Vengeance” by Chris Schweizer. It’s about a sailor named Catfoot Crogan. The book starts with Catfoot tied to a post, being flogged because the captain's a real jerk. Catfoot’s taken inside and patched up. The man who flogged him, Mr. Toomy, becomes really important later on. In a week, Catfoot is called down from the crow's nest. The captain tells him to have a sick man named Codfish relieve him. Catfoot tries to change the captain’s mind, but the captain tells him off. Soon after Codfish is sent up, all the men hear a thud. Codfish has fallen from the shrouds. They have a small funeral and get back to work. But one sailor refuses to work because they had been put on half rations. The captain runs inside. Just when the crew thinks they have won back full rations, the captain rushes back out with two pistols and shoots the man who refused to work. Then he accuses Catfoot of treason. As Catfoot is about to be hung, pirates attack. This is just the beginning. The art in Crogan’s Vengeance looks like it was painted with ink and a brush. It looks very smooth and fluent. There are two other Crogan books. Crogan’s March, which is about a legionnaire in Arabia, and Crogan’s Loyalty, which is about a British soldier and an American soldier. Check out these books, they’re beast-tacular! Still loving the blog--you keep turning me on to books that my bookstore doesn't have, so I wouldn't ever know to order them for my guy without your reviews. Hey Milo! I read a good graphic novel: A Wrinkle In Time adapted by Hope Larson. It's really cool! P.S. My real name is also Milo!!! I'm just using my mom's account. Great review! Makes me think of what we learned at the pirate museum in Provincetown where pirates, supposedly, were often able to run their ships as more of a democracy than a dictatorship. French infantry units during the French Revolution tried running themselves democratically for awhile where the soldiers could vote on whether they would obey a given officer's command. This stopped after French armies kept getting defeated by traditional, royalist armies. Then Napoleon took over.